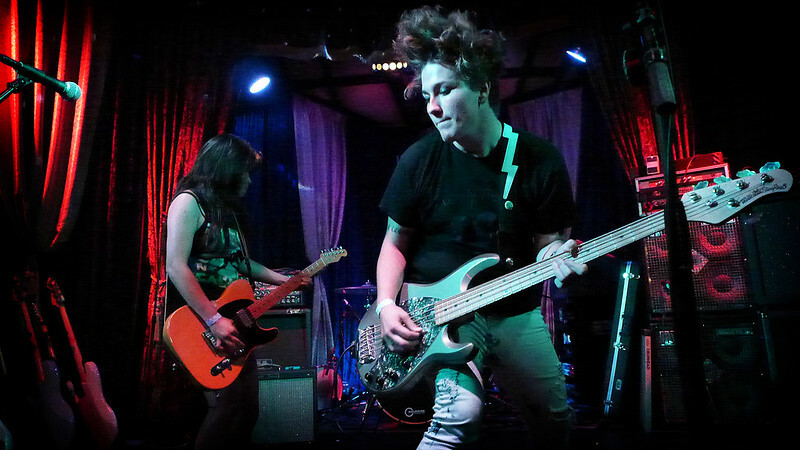 WE ARE / SHE IS RELEASES NEW LYRIC VIDEO FOR "AND THE WORLD"
Merilou Salazar and Jess Meehan of We Are/She Is performs at Boardner's. We Are / She Is, my newest favorite band just released their new lyric video for "And the World" and it's a glittery, pop explosion that I've come to love from this Los Angeles band consisting of Merilou Salazar, Jessie Meehan and Jake Fight. The song along with the video is a cautionary tale of the dangers of progress at the expense of enjoying life as Merilou sings, "...stand up to our love's progression then take it back to recreation." The video imposes shots, side by side, of lush parks and children playing in wide open spaces alongside images of daily progress such as traffic congestion and city development. When she sings, "Dad's back from the hide and seek games. he's shooting but he's missing and he barely knows my name," it's as though We Are/She Is, with the layering of their feel good melodies, are trying to remind us to stop and smell the roses, to appreciate what we all take for granted instead of being too consumed with progress. We recently saw them perform and their set, which consisted of mostly singing songs off their new EP New Game, echoes flashbacks of yester-years - romanticized pop and dance music that reminds us of simpler times of carefree hangouts with friends during warm summer nights, doing nothing but still having the time of your lives hoping this time would never end. Be sure to check We Are / She Is when they perform next month at Los Globos on August 13th and Tribal Cafe on August 23rd.